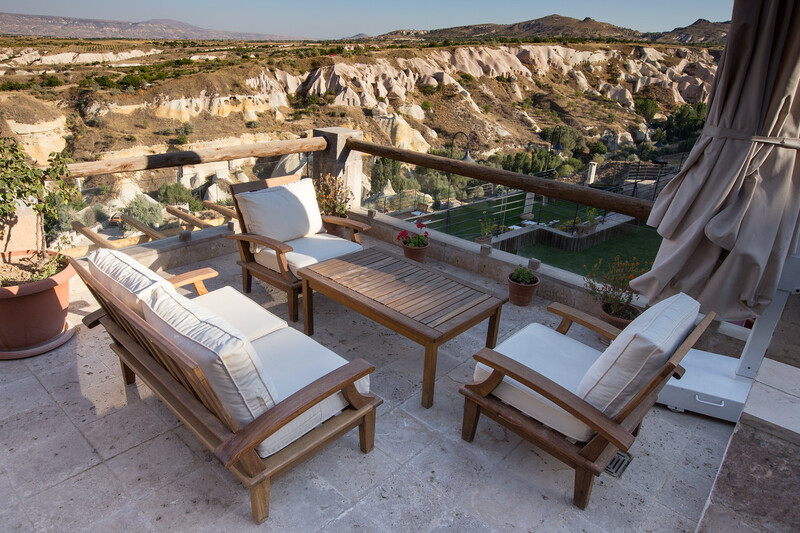 When management of the Taskonaklar Hotel, a boutique cave hotel in Cappadocia in the Anatolian region of central Turkey, asked me to stay with them in one of the best hotels in Cappadocia for a few days I didn’t know what to expect. Before I left for Turkey, many friends told me that staying in a cave hotel should be at the top of my “bucket list,” but I couldn’t get over the fact that, to me, a cave is a damp musty chamber with no light and little comfort. I am glad I ignored my inner voice and kept an open mind because my stay at the Taskonaklar was one of the most exotic, romantic, luxurious and unique experiences I have had in all my travels. 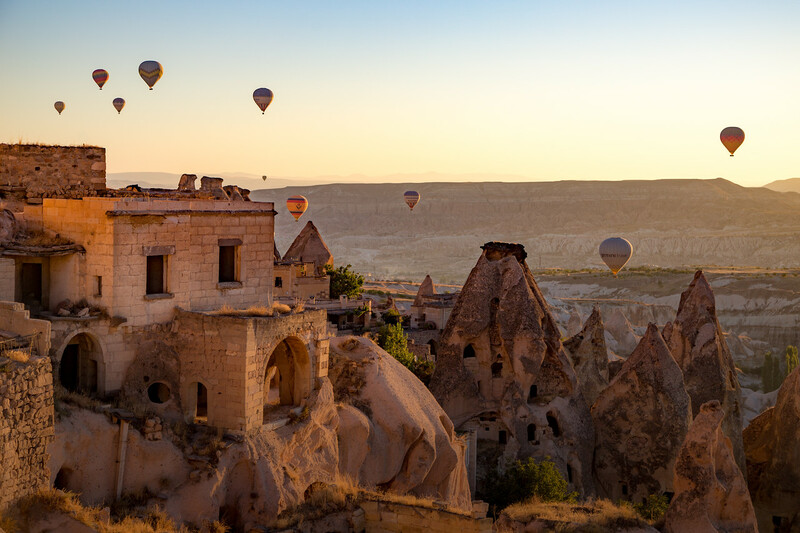 When the prehistoric inhabitants of Cappadocia in what is now the Anatolian region of central Turkey arrived over 4,000 years ago, they discovered a landscape that can only be described as directly from a fairy tale. Ancient volcanic eruptions followed by the eroding effects of wind and water conspired to create one of nature’s most spectacular canvases. Upon finding the pillars, pinnacles, cones, and fairy chimneys that mother nature left behind, the early humans scraped and hollowed this wonderland of soft stone into homes, fortresses, stables, storehouses, and places of worship. The Taskonaklar was constructed from one of the these ancient waypoints. Upon arrival at the Taskonaklar Cave Hotel, I could tell from the well-manicured grounds and the spectacular views of the valley below that I would have to revise my preconceptions of what cave living was like. After being shown to my suite (yes, I had a suite), all I could think of was, “Wow! This is a cave?” The feeling of staying inside of what is a living museum is something that should not be missed, but it is nice to have some pampering at the same time. What Staying at the Taskonaklar Cave Hotel Like? My suite had a huge private patio that overlooked the stunning hiking area known as Pigeon Valley. The suite had hardwood floors, a wood burning fireplace, Turkish rugs, fine linens and all the modern amenities you would expect from a world-class hotel. The bathroom suite, just off of the sitting area, was itself giant. It had stone cabinets, granite floors and importantly (this is a cave after all) a beautiful shower and plenty of excellent lighting. 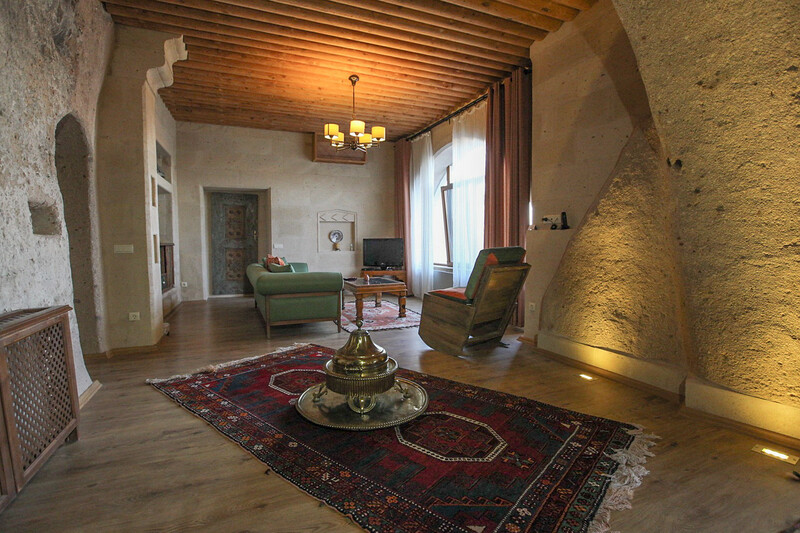 In Turkish the word Taskonaklar means “stone mansion,” and this place has been accommodating guests along the Silk Road, although perhaps not in such luxury, for millennia. In fact, many of the rooms at the Taskonaklar have preserved within them remnants of ancient hospitality. Some rooms once contained ancient kitchens, with chimneys and original tandoors carved in the floor. There are other rooms with long abandoned wine presses that once drained into huge vats carved directly into the rock itself. 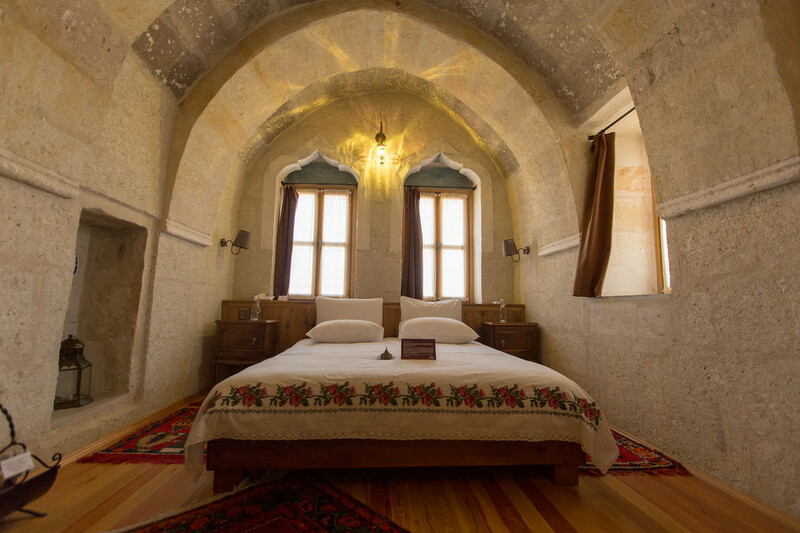 As they slowly expand the Taskonaklar Cave Hotel and scrape out new rooms in other areas on the property they are making new discoveries while carefully incorporating the old with the modern in a way that respects old traditions and modern sensibilities. The Taskonaklar Hotel is located on the edge of the small town of Uchisar and overlooks the fairytale landscape of Pigeon Valley and the massive volcano, Mount Erciyes, far to the east. Every morning I woke early to catch the ever-changing light, have a coffee on my private balcony and watch the hot air balloons float effortlessly past. The Taskonaklar Cave Hotel has an outstanding breakfast with an eclectic mix of traditional fare, homemade Turkish pastries, and other delights. With notice, they will cook up a full Turkish dinner and serve it to you on your private balcony. The hotel is only a short walk to Uchisar, which is slowly gaining a reputation and the go-to place for savvy travelers and gourmands wishing to avoid the touristy crowds of nearby Goreme. To stay at the Taskonaklar Hotel is to enjoy an exceptional experience in an amazing part of the world. If this is the life of a troglodyte, enthusiastically count me in!